Background: The purpose of the study was to compare the postoperative pain intensity between laparoscopic hysterectomy (LH) and vaginal hysterectomy (VH). Materials and methods: In two groups of patients (laparoscopic hysterectomy n=194 – Group A and vaginal hysterectomy n=151 – Group B) we compared average postoperative use of narcotic analgesics by hours in terms of equal dosage and similarity of drugs; we also evaluated postoperative pain intensity by Visual Analogue Scale for Pain (VAS Pain) questionnaire in 24 hours after the intervention. Results and conclusions: Narcotics were used in 31 patients in LH group (15.98%) and 105 patients in VH group (69.54%). Average use of narcotic drugs in LH group was 7:06 hrs, compared to 9:94 hrs in VH group. Postoperative difference in 24 hrs pain intensity was not statistically significant – 1.35 in VH group and 1.12 after LH group. Thus, postoperative pain in first 12 hrs is more intensive after vaginal hysterectomy and lasts longer than after laparoscopic hysterectomy, but in 24 hrs is similar in both groups. Hysterectomy is the most spread gynecological operation worldwide . Annually about 600000 hysterectomies are performed in the USA [2,3]. At the age 60, 20% of women have had hysterectomy [3,4]. There is no clarity about better shortterm outcomes and postoperative rehabilitation between two methods of hysterectomies - laparoscopic and vaginal [5-9]. The purpose of the study was to compare postoperative pain between laparoscopic hysterectomy (LH) and vaginal hysterectomy (VH). Prospective multicenter non-randomized clinical trial was done in patients with benign pathologies who underwent laparoscopic hysterectomy (LH) and vaginal hysterectomy (VH). The study period was January 2014 to January 2017. Medical records of all patients who underwent LH and VH in two clinics (“Aversi Clinic” and “Universe”) were reviewed. Patients with uterine prolapses were not included in the study. Patients with conversion to laparotomy were also excluded from the study. Oncological pathologies were also excluded, other diagnosis were not limited (Table 1). Table 1: Patients undergoing laparoscopic hysterectomy and vaginal hysterectomy. Patients were divided in two groups: Group A (laparoscopic hysterectomy) and Group B (vaginal hysterectomy). Total number of patients was 345-194 in Group A, 151 in Group B. In two groups we compared an average postoperative length and frequency of narcotic analgesics’ use in terms of equal dosage and similarity of drugs [10,11]. Questionnaire of VAS Pain was used to identify pain intensity in 24 hrs after the operation. All the patients signed the consent to participate in the trial. Data were analyzed using the statistical software SPSS version 17. Narcotics were used in 31 patients in Group A (LH) (15.98%) and 105 patients in Group B (VH) (69.54%). Average use of narcotic drugs in Group A was 7:06 hrs (SD=2,31; CI=6.22, 7.91) compared to 9:94 hrs in Group B (SD=3.78; CI=9.19, 10.69) (P=0.001, P<0,05). Results were evaluated in both study groups in terms of equal dosage and similarity of drugs. Questionnaire of postoperative VAS Pain was given to patients in both groups. Patients evaluated pain intensity by 11-point scale in 24 hrs after the operation. Values were following: 1.35 in Group A and 1.12 in Group B (P=0.101, P>0.05). There are only few recent studies comparing postoperative pain after laparoscopic and vaginal hysterectomy. In Ghezzi F  prospective randomized trial laparoscopic hysterectomy was compared to vaginal hysterectomy in patients with uterine volume ≤ 14 weeks of gestation. Postoperative pain was measured using the visual analog scale (VAS) at 1, 3, 8, and 24 hours postoperatively. Intra- and postoperative outcomes were recorded, including the need for postoperative rescue doses of analgesia. As a result patients who underwent vaginal hysterectomy complained of higher postoperative pain at each VAS evaluation (VAS-1 hour, P<0.0001; VAS- 3 hour, P<0.0001; VAS-8 hour, P<0.0001; VAS-24 hour, P=0.0003) with a higher need for rescue analgesia (P<0.0001) and a longer hospitalization (P=0.001). The limitation of this study is that a number of patients involved are small – total 82. In Pokkinen prospective nonrandomized trial  postoperative persistent pain was studied in 6 months after laparoscopic hysterectomy (n=150) and vaginal hysterectomy (n=92). A pain questionnaire was used. As a result, pain was of similar strength (mild) in both groups. This study is giving the results of a long-term period after the operation and there are not many studies of short-term periods after the operation [13,14]. 2. Narcotic drugs were used for longer period after VH than LH (7.06 hrs and 9.94 hrs respectively) (P=0.001). 3. Average pain values in 24 hrs were not statistically significant – 1.35 in Group A and 1.12 in Group B. Our trial evaluated pain by two criteria’s - as by VAS scale, also by usage of narcotic drugs (Figure 1). The limitation of the study is that sample size is not sufficient to be used for every patient: only two clinics were studied where one surgeon operated all patients. Different surgeons with individual operating technique could affect postoperative period and pain intensity of a patient [15,16]. Also, we used questionnaire VAS and used it to access the intensity of pain in one person, but we did not compare among different people. For future works patients should be categorized, for example, by age, body mass index, uterine size, etc. [2,17]. 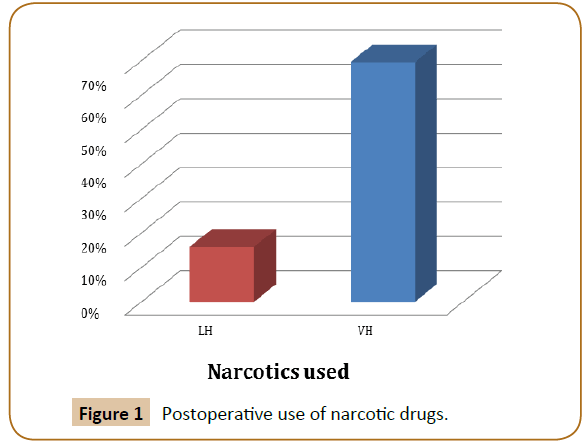 Figure 1: Postoperative use of narcotic drugs. It seems that postoperative pain in first hours is more intensive after vaginal hysterectomy and lasts longer than after laparoscopic hysterectomy, but is similar in 24 hrs. More researches are needed to study postoperative pain intensity and rehabilitation after laparoscopic and vaginal hysterectomies in long-term period. Haibo W, Ping L, Xiujuan L, Licai G, Caihong Lu, et al. 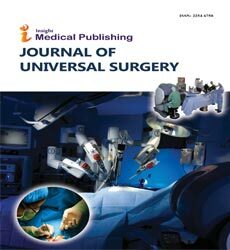 (2016) Total laparoscopic hysterectomy in patients with Large Uteri: Comparison of uterine removal by transvaginal and uterine morcellation approaches. Biomed Res Int 7. (2015) Centers for disease control and prevention website, Key statistics from the national survey of family growth, Atlanta, GA: Centers for Disease Control and Prevention. Whiteman MK, Hillis SD, Jamieson DJ, Morrow B, Podgornik MN, et al. (2008) Inpatient hysterectomy surveillance in the United States 2000-2004. Am J Obstet Gynecol 198: 34e1-34e7. (2011) Women’s Health Stats and Facts: The American Congress of Obstetricians and Gynecologists. Choi KJ, Kim HB, Park SH (2012) The comparison of postoperative pain: total laparoscopic hysterectomy versus vaginal hysterectomy. Korean J Obstet Gynecol 55: 384-389. Nascimento MC, Kelley A, Martitsch C, Weidner I, Obermair A, et al. (2005) Postoperative analgesic requirements – total laparoscopic hysterectomy versus vaginal hysterectomy. Aust N Z J Obstet Gynaecol 45: 140-143. Ottosen C, Lingman G, Ottosen L (2000) Three methods for hysterectomy a randomized prospective study of short term outcome. BJOG 107: 1380-1385. Patel R, Chakravarty N (2014) Comparative study of laparoscopic hysterectomy versus vaginal hysterectomy Int J Med Sci Public Health 3: 335-337. Ghezzi F, Uccella S, Cromi A, Siesto G, Serati M (2010) Postoperative pain after laparoscopic and vaginal hysterectomy for benign gynecologic disease: a randomized trial. Am J Obstet Gynecol 203: 118.e1-e8. Hillis SD, Marchbanks PA, Peterson HB (1996) Uterine size and risk of complications among women undergoing abdominal hysterectomy for leiomyomas. Obstet Gynecol 87: 539-543. Bonilla DJ, Mains L, Whitaker R, Crawford B, Finan B, et al. (2007) Uterine weight as a predictor of morbidity after a benign abdominal and total laparoscopic hysterectomy. J Reprod Med 52: 490-498. Fenton FB, Switzer M, Johnson J, Clemons J (2008) Laparoscopic-assisted vaginal hysterectomy for uteri weighing 1000 grams or more. JSLS 12: 376-379. Wang CJ, Yen CF, Lee CL, Tashi T, Soong YK (2004) Laparoscopically assisted vaginal hysterectomy for large uterus: a comparative study. Europ J Obstet Gynec Reprod Biol 115: 219-223. Sesti F, Cosi V, Calonzi V et al. (2014) Randomized comparison of total laparoscopic, laparoscopically assisted vaginal and vaginal hysterectomies for myomatous uteri. Arch Gynecol Obstet 290: 485-491. Serur E, Lakhi N (2011) Laparoscopic hysterectomy with manual morcellation of the uterus: an original technique that permits the safe and quick removal of a large uterus. Am. J. Obstet. Gynec 204: 566.e1-566.e2. Miranda CS, Carvajal CR (2003) Complications of operative gynecological laparoscopy. JSLS 7: 53-58. Kim MJ, Kim S, Bae HS, Lee JK, Lee NW, et al. (2014) Evaluation of risk factors of vaginal cuff dehiscence after hysterectomy. Obstet Gynecol Sci 57: 136-143.